I'm looking for help with a bike I bought about a week ago, I would stress that this bike is brand new, not used before. The bike arrived mostly assembled and one thing I needed to do was slot the handlebars + stem into the bike frame and tighten the bolt in order to hold the stem tight so it turns with the front wheel. However when I tighten the bolt the handlebars + stem are still able to move with relative ease. I have attached some photos to help explain the problem. As you can see when I move the front wheel the stem and handlebars move with it as they should, however when I clamp the front wheel I am able to move rotate the handlebars (as in the stem is moving) with ease. I would also point out that the bolt at the top is very tight and I am still able to create the rotation with ease. Also is a picture of the wedge to show that it is tightening as intended. I may just be being very stupid but I'm totally baffled. I have contacted the seller and they are trying to help but I wanted another opinion on this to make sure it is a fault and not just me being daft. I am not literate in cycling language so please keep that in mind with any suggestions. Thanks for reading and thanks in advance for any help you may try and give. Measure the inside diameter of the fork with calipers in mm). Compare to what's written on the stem. With a new bike I doubt the stem would be the wrong size. But worth checking. Quality control is a farce. But yes do check the bolt to see if its threaded high enough and check the angled faces for burr. Put a little bit of grease on it and try again. With a small wrench do not go gorilla on it. "With a new bike I doubt the stem would be the wrong size. But worth checking. Quality control is a farce"
You never know what you are going to get. 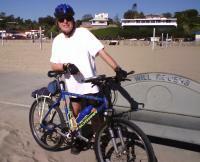 I bought a Cannondale out east for my daughter back in 96' to surprise her for her B-day. I never test rode it, I just bargained a deal with the shop because i told them I was just passing through and they would never see me again, they took my offer and I hit the road. It turned out to have an 8 speed shifter on a 7 speed bike. I forced the Cannondale dealer in town to make it right, I went to pick it up and they wanted to charge me for the 7 speed shifter and never handed me the 8 speed shifter. I told them just keep the 8 speed shifter like you must have intended to in the first place, we are even thanks for nothing and walked out. then a couple years ago went to put a rack on it and noticed the hole mount was faulty with a chunk of something in the threads and then it made it thru the paint line. There is one rare and unpleasant possibility. 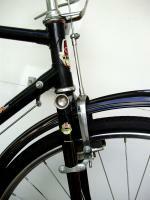 It's possible by over-torquing the bolt to distort the fork column so that the stem will no longer hold. NOT easy to do, but possible. Man that would take a lot of gorillas. I think the threads would strip first. But then I have seen some weird stuff . We are guessing here without input from OP. A LOT of strange things passed through my hands in over 20 years of wrenching - I listed that because I have seen it happen - though I believe it was on less expensive bikes, or ones that were tightened down hard and subject to an accident. The stem should always be tightened so that it gives on sudden impact.